—This post is sponsored by the British Columbia Blueberry Council, who represent over 800 blueberry growers, located in some of Canada's most rich and fertile farmland. Their growers are proud to produce high quality highbush blueberries (the larger, plump berries) that are enjoyed in Canada and worldwide. Thank you for supporting the organizations and brands that support Poppytalk. All opinions are our own. Blueberry season (July/August) is upon us and this year we were surprised to find out our local blueberries are here a couple of weeks early, thanks to mild spring we had. If you saw our Snapchat last week you may have spotted a pic or two of these voluptuous berries, and just like last year, they are especially delicious. Must be all that sunshine we've been having. Perfect for a refreshing treat this summer! 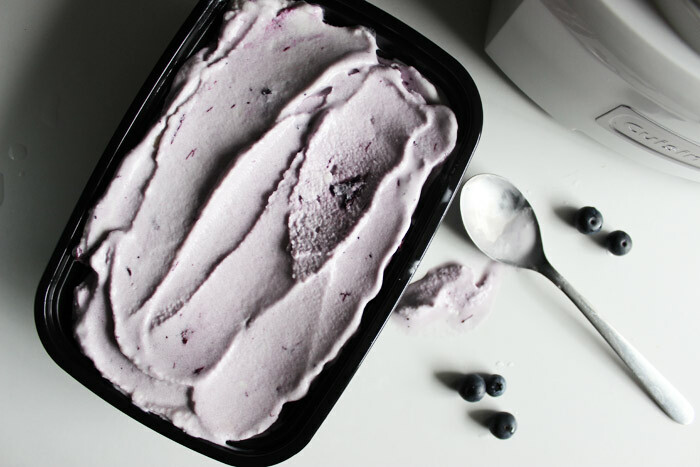 We've been wanting to make a blueberry ice cream for a while now, and have been patiently waiting for the fresh local berries to arrive. 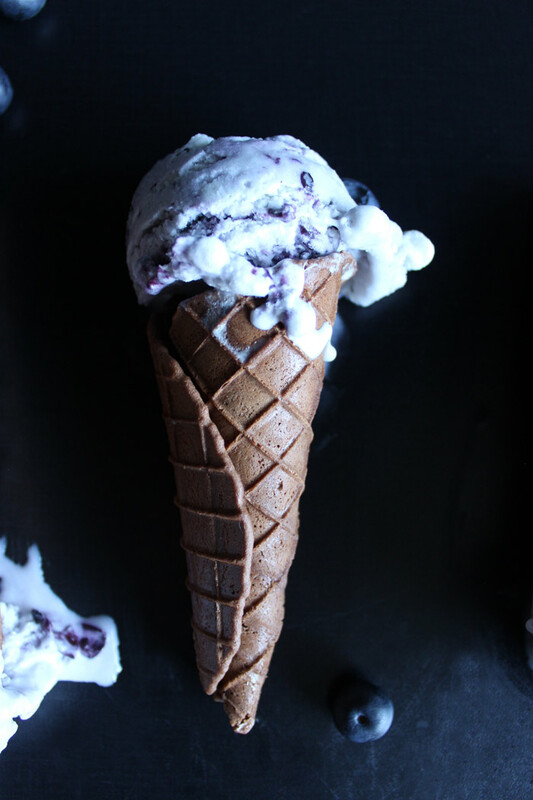 This recipe is probably the healthiest ice cream treat we've made so far, because not only is the ice cream vegan, it's filled with all those amazing anti-oxidants blueberries naturally create. 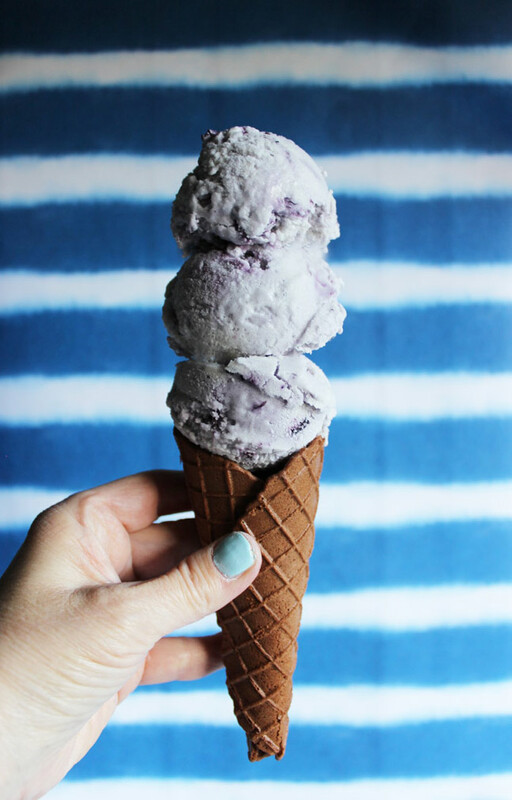 We've taken our favorite coconut based ice cream recipe and added a swirl of fresh blueberry syrup (sans sugar). 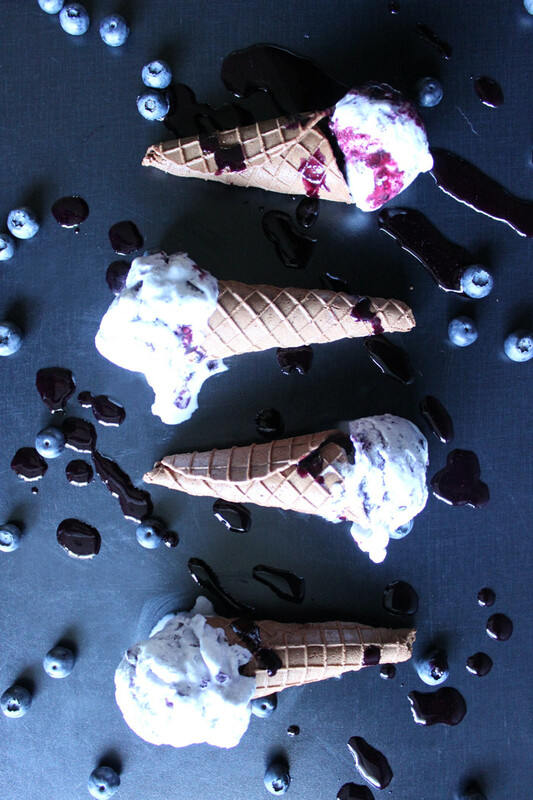 Our secret is the sweet blueberries and a hint of maple syrup. 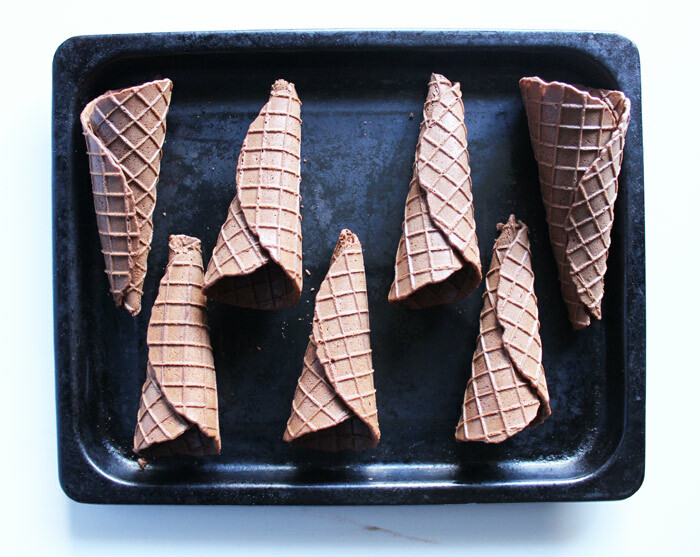 To compliment this cool treat, we also made our own waffle cones. We have two versions, a gluten free recipe using almond flour and a dark chocolate option using regular flour and a delicious dark chocolate and cocoa. 24 hours before you wish to make your ice cream. Place the ice cream freezer bowl in freezer. In a medium bowl, whisk to combine the coconut milk, maple syrup and vanilla. Cover and refrigerate 1 to 2 hours, or overnight. Turn on the ice cream maker first (very important), and then pour the coconut mixture into the frozen freezer bowl and let mix until thickened, about 15 to 20 minutes. In the meantime, make the blueberry syrup. 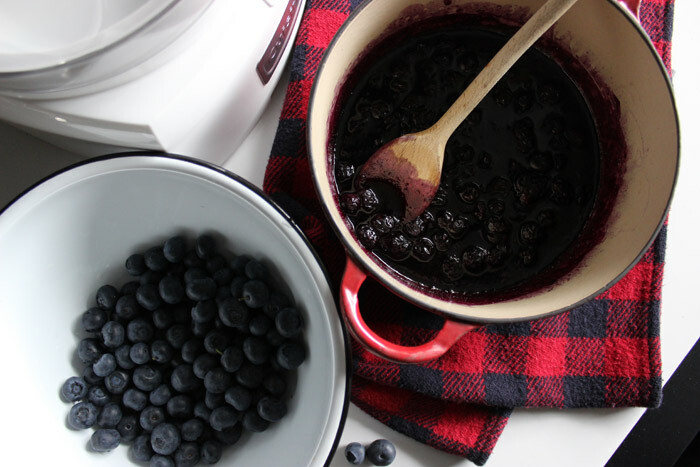 In a small saucepan, add both the blueberries and maple syrup. Bring to a boil, while stirring and simmer for about 4 minutes, until it starts to thicken. Remove from heat and pour mixture through a sieve, pressing out all the juices from the blueberries. Set aside to cool. Once the ice cream is nearly finished. Pour in the blueberry syrup, to create a nice swirl. The ice cream will have a soft, creamy texture. If a firmer consistency is desired, transfer the ice cream to an airtight container and place in freezer for about 2 hours. Remove from freezer about 15 minutes before serving. 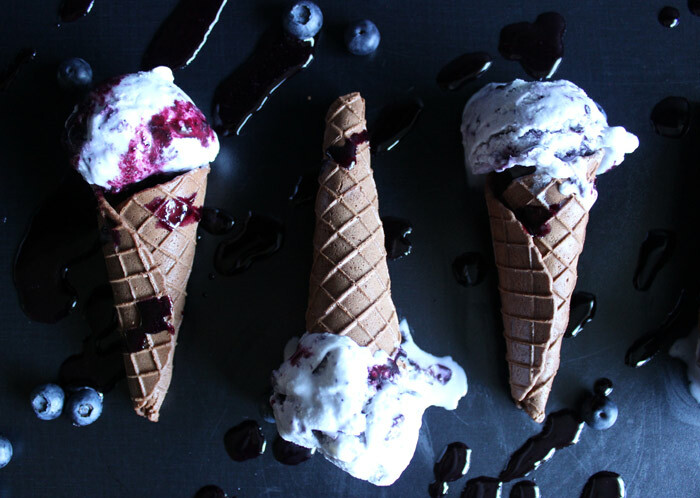 For this recipe, we wanted a harder ice cream so we froze the ice cream for a few hours. Preheat the waffle cone iron to medium heat (or setting 3 on ours). Melt the chocolate and butter together in the microwave for approximately 1 minute, stirring half way. Stir until smooth and combined. Set aside to cool (at least 5 minutes). Whisk the eggs and salt in a bowl until well blended. Beat in the sugar and blend until sugar is incorporated and the egg is slightly lightened in colour. Add in the melted chocolate and butter mixture. Stir in the flour and cocoa powder until all the flour has dissolved and no lumps remain. Add vanilla. Spoon 1 heaping tablespoon of batter onto the center of the iron. (Note: This makes a medium sized cone. If you want a larger size, spoon in 2 tablespoons). Close the lid and bake for 1 minute, check for colour, and cook an additional 20 to 40 seconds if necessary. 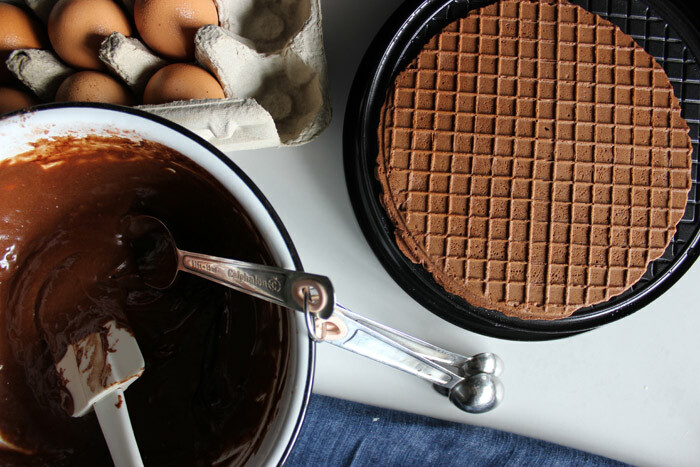 Once baked, quickly remove the waffle from the iron using a spatula, and place onto a clean towel. 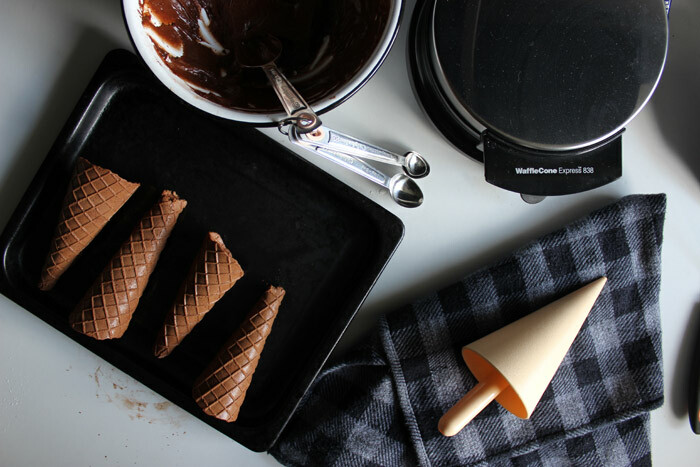 Using the towel, start to roll the waffle around the cone form and hold for approximately 30 seconds to set its shape. Place the cone on a wire rack to cool. It will quickly harden. Heat waffle cone iron to medium heat. In a blender or bowl, blend eggs, add in maple syrup, vanilla and almond flour. Mix until smooth. Drop 1 Tbsp of batter into the centre of the waffle iron and close lid. Bake for approximately 2 minutes or until browned to your liking. (Note these cones don't harden like the regular flour cones, so you'll need to tie them together with bakers twine. Also if they soften up after being left out, place in the oven to crisp up). The British Columbia Blueberry Council represents over 800 blueberry growers, located in some of Canada's most rich and fertile farmland. Plantings of premium quality highbush blueberries top 11,300 hectares in British Columbia and produce upwards of 77 million kilograms (172 million pounds) of blueberries annually. With more than $1 billion in sales in the past five years, Canada is the third largest national producer of sweet and juicy highbush blueberries in the world. Available fresh in B.C. from June through August, BC blueberries are also frozen, dried, juiced, puréed and powdered, available for year round-distribution throughout Canada and around the world. Find more than 100 recipes on the BC Blueberry website at bcblueberry.com. And more info here.